Brussels — European Union officials and global health bodies have called for help for poorer countries as growing resistance to antibiotics threatens to become a 'global health tragedy' and jeopardises Sustainable Development Goals in some parts of the world. Antimicrobial resistance (AMR) has risen by as much as two thirds in the last two decades, according to some studies, and is now responsible for an estimated 700,000 deaths annually worldwide. But this is projected to rise to 10 million per year by 2050 and cost up to 100 trillion dollars unless governments ramp up efforts to tackle it. The growing problem with AMR has been put down largely to inappropriate use of antibiotics for both humans and animals. As antibiotics have been used more widely and more frequently in both humans and animals, bacteria have built up resistance to them, rendering them effectively useless in some cases. Doctors say this would make routine operations more dangerous and certain medical treatments, such as for some cancers, would disappear completely. When antibiotic resistance emerges in one place it also quickly spreads to other locations, meaning it must be tackled on a global scale. While all World Health Organization (WHO) member states signed up to a multi-sectoral Global Action Plan on AMR in 2015, progress on its implementation has been mixed. Some countries, notably in Europe, have made good progress, in other parts of the world things have moved much more slowly, if at all, raising fears that in poorer countries the problem is worsening and SDGs may not be reached. EU Commissioner for Health and Food Safety, Dr Vytenis Andriukalitis, told IPS: "We need a global framework for tackling AMR in all regions, not just Europe. It needs to be dealt with because otherwise some countries won't be reaching the SDGs." The size of the challenge presented by AMR in developing countries has been underlined in a slew of data and studies released during the World Antibiotic Awareness week last month (November). An Organisation for Economic Co-operation and Development (OECD) study showed that while AMR rates averaged 17 percent in OECD countries in 2015, rates in India, China and Russia averaged 42 percent and were as high as 90 percent for some antibiotic-bacteria combinations. Meanwhile, it said, AMR is forecast to grow up to four to seven time faster in some low and middle-income countries than in OECD states and in countries where healthcare systems are financially constrained, AMR is likely to cause 'an enormous' death toll, mainly among new-borns, infants and the elderly. Another study earlier this year by researchers at ETH Zurich, the University of Antwerp and Princeton University showed that while global use of antibiotics in humans was estimated to have risen 65 percent between 2000 - 2015, use in low- and middle-income countries increased 114 percent. Developing new antibiotics is complex - it has been decades since new classes of antibiotics were invented - and much of the focus in fighting AMR is being put on prevention. The Global Action Plan is based on a multi-sectoral approach to AMR and charges governments with adopting national action plans involving improved awareness, understanding, surveillance, stewardship and prevention and control measures. But in many developing countries, lack of funds in both healthcare and animal industries as well as weak legislation and enforcement are major barriers to those measures being effectively implemented. In India, for example, where it is thought that as many as 120,000 babies alone die every year from sepsis caused by antimicrobial-resistant infections, doctors say two of the key factors behind rising AMR are pharmacies selling antibiotics without a prescription and poor infection control in overcrowded healthcare facilities. Supporters of over the counter antibiotic sales in India argue that it is vital that antibiotics are available without prescription as there is a severe shortage of qualified doctors in many areas. The government has tried to limit the sale of at least so-called 'last resort' antibiotics which are used when all others fail. However, the measure - putting a red line on boxes of the medicines in pharmacies to alert people - has been largely ineffective. There are also concerns over the use of antibiotics in livestock. 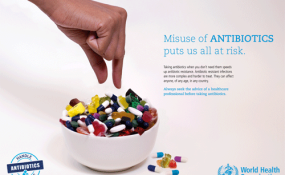 According to the European Commission, in Europe, 70 percent of antimicrobials are consumed in food-producing animals. The figure is similar in the U.S. and is over 50 percent in China. But monitoring antibiotic use in the animal industry in poorer countries is often more difficult. "[Use of antibiotics in animal farming] is extremely difficult to enforce unless you have very good legislation and a system for monitoring," Dr Nedret Emiroglu, Director Programme Manager, WHO Europe, told IPS. While legislation on animal antibiotic use exists and is closely checked in developed states, particularly in the EU, in poorer countries it is sometimes absent or adherence is impossible to monitor effectively because of a lack of resources. Despite the Indian government's approval of a national action plan on AMR a year a half ago, critics point out that legislation and networks to control use of antibiotics for animal growth and tracking the sale and use of antibiotics in food production are, in reality, non-existent or ineffective. The WHO has said that many middle- and low-income countries may need long-term development assistance to implement their AMR plans effectively and sustainably. "We need financial support for low and middle-income countries," Emiroglu told IPS. She added this was crucial to ensure progress in one region of the world was not undermined by a lack of progress elsewhere. "AMR knows no boundaries. What happens in one part of the world affects people in another," she told IPS. But many experts on healthcare in developing countries say a one-size fits all approach for all developing states will not work. "Measures need to be different for different countries, especially when we are talking about poorer states. You cannot compare somewhere like India and Liberia," Andriukalitis told IPS. "In some countries they have problems with access to simple antibiotics, but in others there are problems because people are self-treating with no proper controls. In some places there is a lack of any basic understanding of hygiene and sanitation. We need long-term local strategies for [different] countries," he added. Meanwhile, AMR is putting SDGs in jeopardy in some places. Although AMR alone is unlikely to stop an SDG being achieved, left unchecked it could contribute to health, poverty and sustainable economic growth SDG targets being missed. Longer hospital stays because of slower patient recovery and greater risk of treatment complications would put a massive extra strain on already struggling healthcare systems and worsen mortality rates and quality of life. Economies would be hit hard with the cost of not dealing with AMR forecast to cause a drop of as much as 3.8 percent in global GDP by 2050. Meanwhile, AMR makes illnesses more expensive to treat and, as universal health coverage is limited in many poor countries and people have to pay out of their own pockets for treatment, these increased costs - as well as potential loss of income from morbidity and mortality - could drive individuals and families with limited resources into even greater poverty. Dr Andrea Ammon, Director of the European Centre for Disease Prevention and Control (ECDC) which has been involved in monitoring AMR in Europe, told IPS: "To achieve SDG3 [on health], AMR is not the only issue that needs to be addressed, but it is a crucial component. "A high rate of AMR indicates that various elements in a health system may not be working satisfactorily because of a mix of factors. The factors causing high AMR rates could be cultural values, behaviour of healthcare providers and patients, regulatory issues such as OTC availability, or infection control. These factors may also prevent other targets included within SDG3 being achieved."